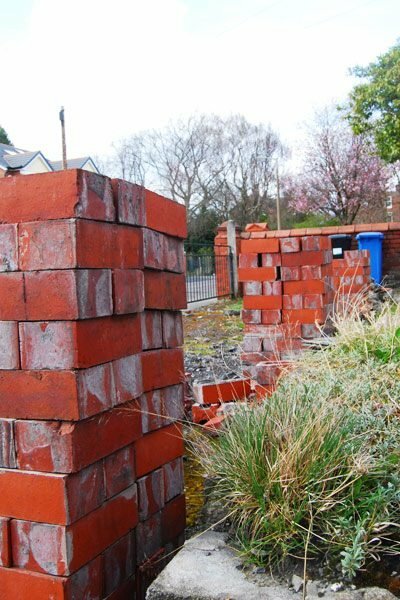 Yesterday we told you about some of our DIY mishaps and general things that haven’t gone quite as planned in the house. You can read more about them here. These dents that mysteriously appeared on our living room floor are one of those things that weren’t quite planned. Repairing the floor has been on our very, very long To-Do list for a while. But now it’s done! All in all, it took less than 30 minutes of work to repair the floor and I’m really surprised how easy and effective the method we used was. 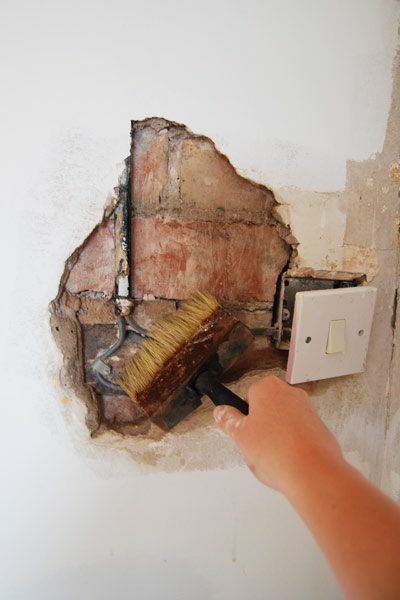 You can even use the same method to repair other wooden surfaces like furniture, moulding, doors, etc. #1 This is the floor before starting work. I have to admit that I was slightly sceptical about the method, but it worked so well! We can’t recommend it highly enough! You can see that there are clear marks that look like they may have been caused by a stiletto heel. #2 In order to allow the wood to return to its original shape, you will have to remove any layers of paint or varnish and then slightly roughen up the surface with some fine sandpaper. 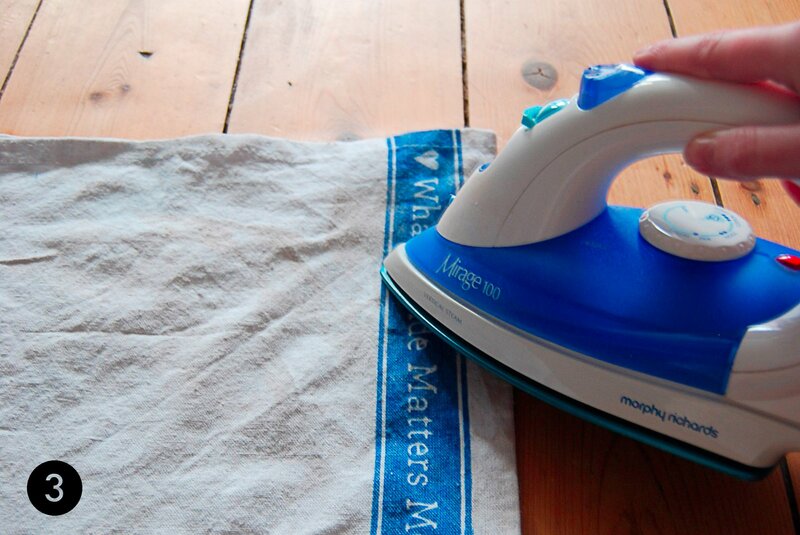 #3 Turn on the iron and wait until it has warmed up completely meanwhile soak a tea towel in some water until it is wet, but not dripping. Then place the towel onto the area with the dents. Make sure the towel is flat and has no folds in it. With the hot iron, carefully rub over the area of the towel under which the dent you want to remove is. Only do this for a second or two at a time and make sure that the towel is always damp so that enough steam can develop to penetrate the wood. 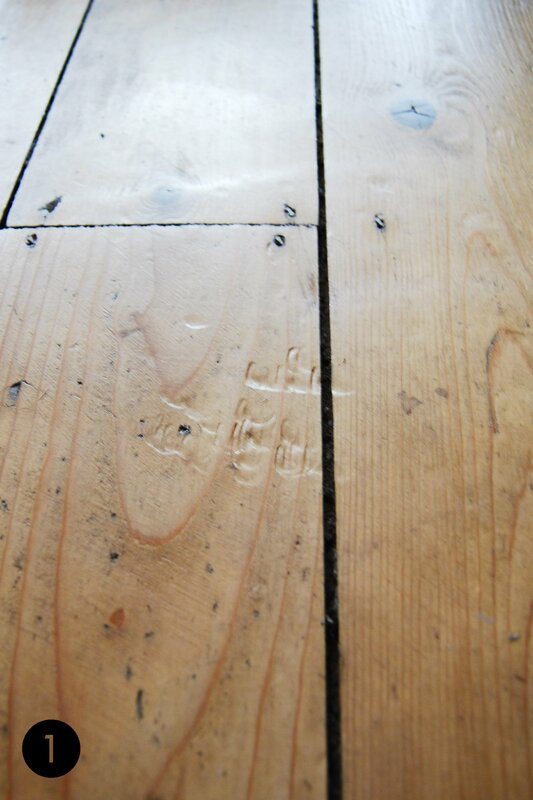 Keep checking the area and repeat the process as necessary until the wood grain has risen. #4 You will now have to let the area you’ve been working on dry thoroughly. 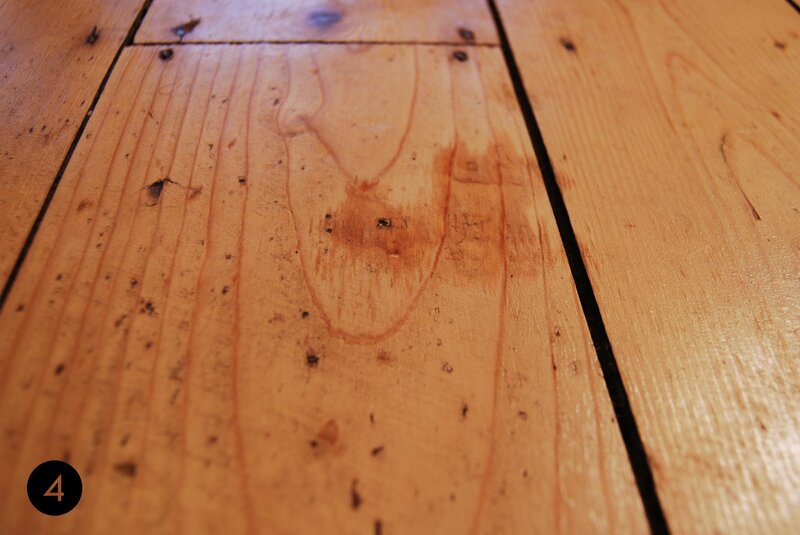 You can see that the darker area is wet where the steam has penetrated the wood. The lighter area hasn’t been sanded and therefore the steam can’t penetrate the varnish. 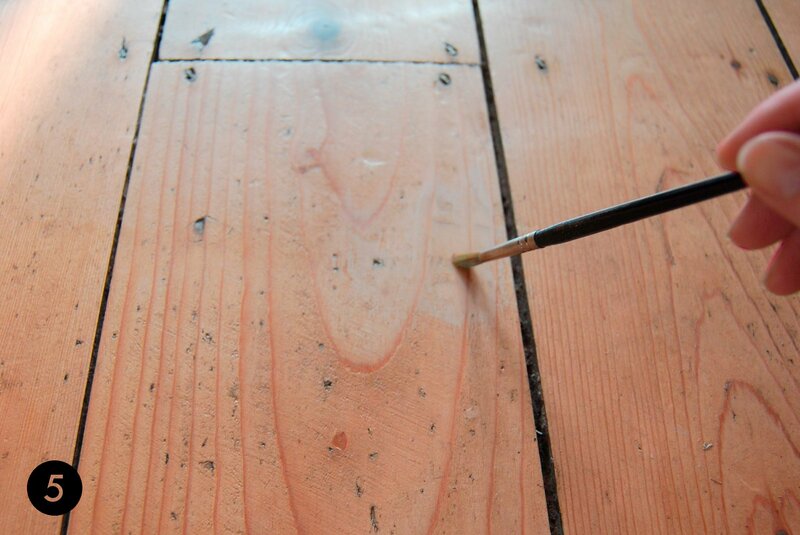 When it’s completely dry, give it another quick sand (always in direction of the grain) with some fine sandpaper. #5 The last step is to reseal the surface. 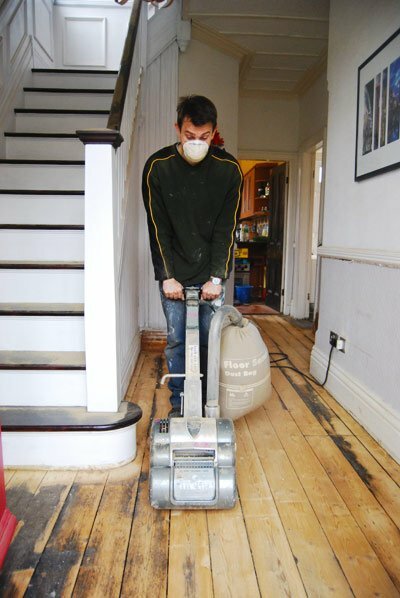 In our case, the floor was covered in clear varnish which now just needs touching up. You’d hardly know that there was ever a dint there! I can’t emphasize enough how easy and effective this method is. 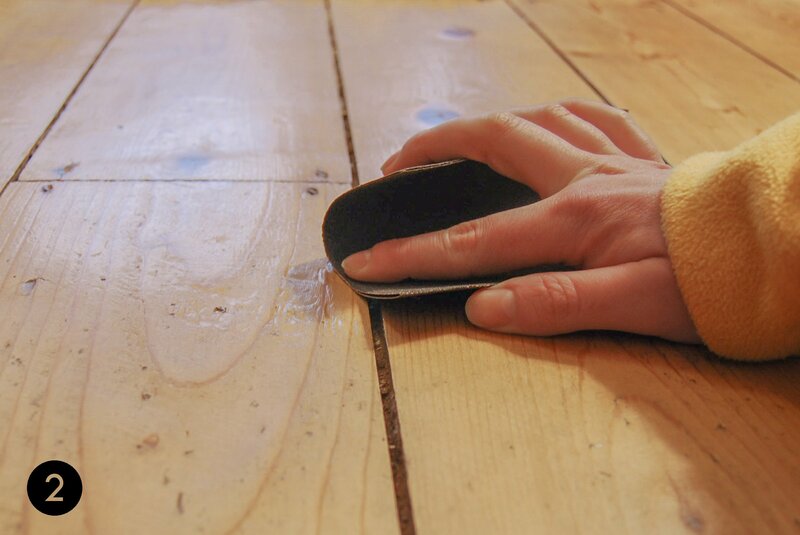 It will only work on normal wood surfaces and not on compressed wood or varnished surfaces. 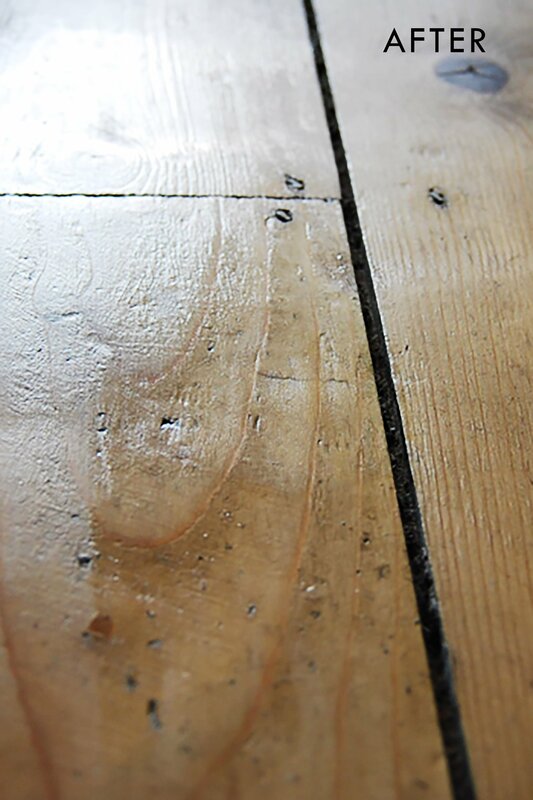 Do you have any damaged furniture or floorboards? If you try this method, let us know how you get on! Wow! Amazing! It’s like there never was any problem on that part of the wood! I know! I could hardly believe how well it worked. I almost wish I had some dents in my furniture to repair! Great to see this in action! I’ve read about this before, but I somehow didn’t believe it would really work. 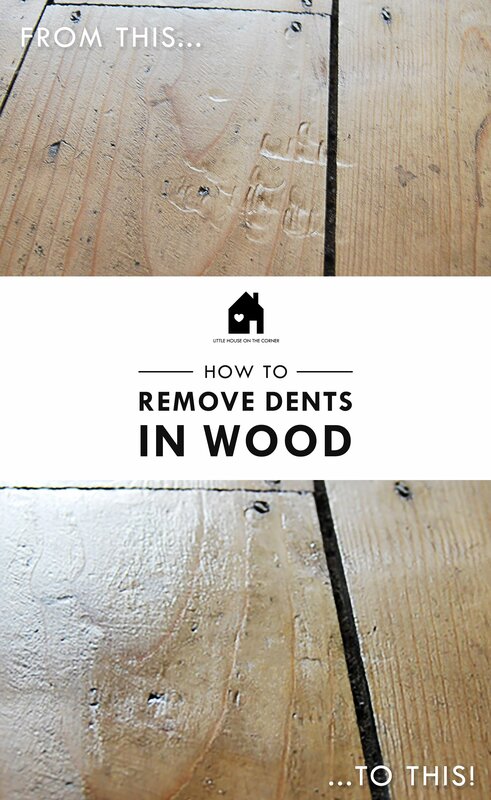 We have dents all over our floors, but I’m determined to tackle them now. Thanks Jesse! I still can’t get over how easy and effective it was. You should definitely give it a try, it’s so worth it! An old trick for fixing dents in frame restoration would work in a similar way, especially if you don’t want to deal with sanding/fixing the finish. Take a sewing pin and pepper the surface of the dent with tiny holes. Take a small bit of toilet tissue, wet it, and ball it into the dent. Leave it until it’s dry and the dent should be fixed when you take it off. That’s a great tip! If we ever have any more dents to repair we’ll definitely give it a try – thanks for sharing. I’m so happy to hear that it worked for you, Izzy! Thank you so much for the feedback – we love hearing when things have worked out! That’s not an easy question to answer Mandy! We had large gaps between our floorboards in our master bedroom, so we took up all floorboards and pushed them closer together (make sure they don’t touch though). Alternatively you can fill the gaps with a mixture of sawdust and woodglue, but this isn’t an overly durable solution. There are also special products to seal the gaps – they’re essentially V-shaped strips of plastic that you squash into the joint. (something like this: . It really all depends on how big the gap is, but I’d say the two real options are move your floorboards closer together or live with the gaps. I have never seen this done before, so thanks! Let’s hope I remember it when I need to fix a dent in the future. It’s a trick I learned at a joinery, Vanessa. I love how sometimes little tricks can make a big difference! So glad it worked for you, Pavel! Thanks for the feedback! PS. Your English is great – nothing to worry about!